Esperit Youngs is the first Dutch company to switch fully to using the Growcoon in its growing systems. It is a fast-growing nursery in the Westland area that is a pioneer in applying new technology. The ficus vaieties in particular that Esperit cultivates are a leading product on the European market. Esperit uses the Growcoon when taking cuttings and cultivating young plants. The company considers the key benefits of the Growcoon to be greater efficiency and plant quality. Esperit Youngs is located in ’s-Gravenzande, part of the Westland municipality. The company specialises in the production of top-quality shoot material and exclusive pot plants, specifically ficus. It works 4.5 hectares, using not only ebb and flood systems, but also irrigation mats. The glasshouses are equipped with the latest technology with an eye on the future and the environment. Esperit supplies some 10 million shoots annually to growers and exporters worldwide. The main benefit for Esperit Young Plants is the strong and rapid development of roots and fine hair roots. Esperit Youngs wants to meet the growing demand for a wider range of shoot material. Economies of scale also have consequences for sales: although the number of growers is in decline, the companies are getting larger. Esperit is actively capitalising on this development. Partly through further developing its range with patent varieties. But also by giving priority to greater efficiency and quality in the cultivation process to meet growing demand. Sustainable solutions are a current trend. Esperit Youngs is making more and more use of organic pesticides. Esperit Youngs was introduced to the Growcoon in 2013 by horticultural supplier Horticoop. The results of the first tests were very promising. All the more because the product turned out to fit very well into the existing automated cultivation process. Esperit thus became the first user of the Growcoon dispenser. Automation was a precondition of the company. But what exactly does it deliver in concrete terms? The main benefit for Esperit Youngs is the strong and rapid development of roots and fine hair roots. This means Esperit can deliver or pot up plants quicker. And that results in a 20% faster turnaround of shoot material. The shoot medium can be filled daily by the right amount in the correct tray. These trays can be processed directly. Thanks to the loosely filled substrate, shoots can be planted more easily. And that results in a significant time saving and better and faster development of the crops. It also means things are more calm within the company. All actions – from filling trays to delivering shoots – remain under one roof. These days, 100% of the shoots are produced using the Growcoon. Esperit Youngs considers areas for improvement to include the uniformity of the final product in combination with the Growcoon dispenser. The key steps towards this goal have already been taken. 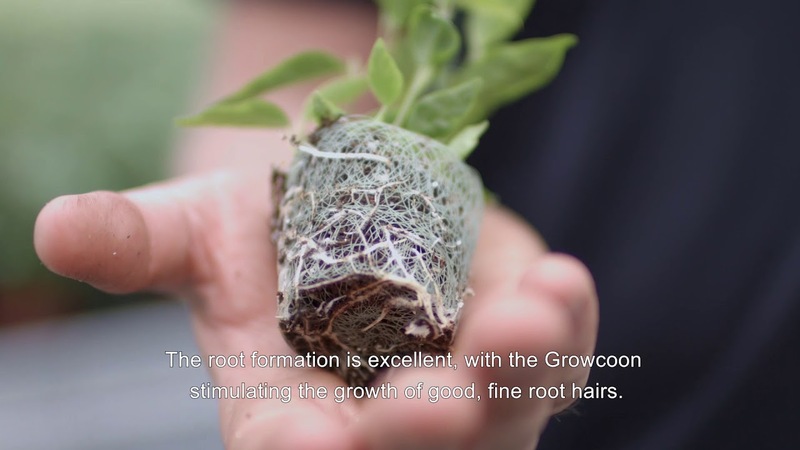 The company also expects that the Growcoon will allow it to capitalise more effectively on demand from retailers for a sustainably cultivated product. After all, the Growcoon is biodegradable. The Growcoon generates major added value in the annual and biennial segment. Interested in the story of the Growcoon?